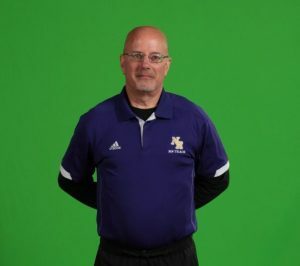 Throughout the season we will “Spotlight” the Coaches from the various North Royalton Middle School Teams. Today, the “Spotlight” shines on Dean Chuppa of the Boys and Girls Middle School Track Teams. We recently had the opportunity to learn a little more about Coach Chuppa and his life on and off the field. [Have you coached any other teams?] I have been coaching in the district for 35 years. I have coached boys and girls basketball, football, baseball, wrestling for one year, track and I will be the Girls JV Golf Coach this coming school year. [Did you play any sports growing up?] Yes, I did. I played all sports, but for North Royalton I played basketball. [Do you have a pre-game routine and/or any superstitions?] I just pray to myself that all th athletes and participants are safe and injury free. [What is your best spots memory?] Best memory is when I was the Head Coach of the Girls Basketball Team and we went to regionals We were in the final 16 of the state. [Who is your favorite team or professional player and Why?] My favorite professional athlete was Julius Erving. I loved the way he played, but more importantly what he stood for. [What has been your favorite vacation?] All of them. Anytime our family can go on a vacation somewhere it is great. [What is your personal goal for coaching?] To develop relationships with the athletes and coaches and to teach life skills to the athletes in a fun and enjoyable environment. [What message do you have to the youth who want to play for you in Middle School?] Whatever sport it is I always have a motto. Play Hard, Play Smart, Play Together and Have Fun! !